We’ve been coming here off and on for many years and while it has had some ownership changes, they still have buttermilk biscuits on the menu, so I’ll still keep pestering Mr. K to stop off here whenever we are driving by on our way up north, in this case to spend the weekend up in Bodega Bay with his family at a rental by the beach. 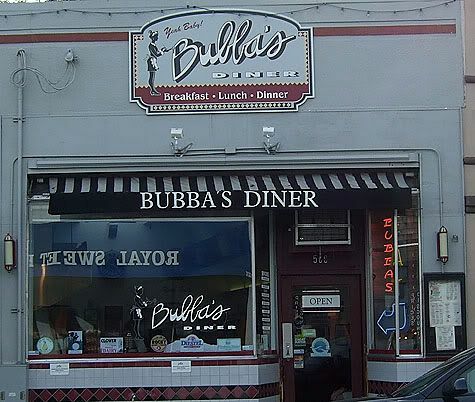 Bubba’s was one of the first retro delux diners where I had my first iceberg wedge salad served with local organic blue cheese dressing and sprinkled with bacon. I was sorry to see that they no longer have chicken fricassee on the menu (which went so well with the biscuits), but there are plenty of other delicious sounding items and you can order anything from the menu all day long. 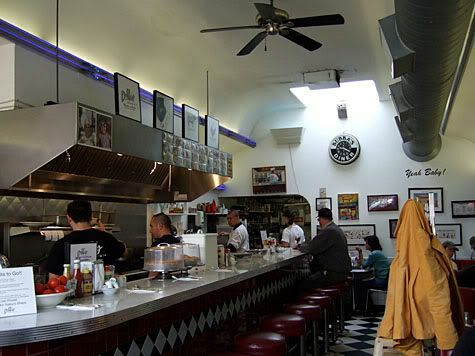 The narrow diner has a long tiled counter and booths along the walls and can apparently squeeze in 32 people. Bubba’s is a Marin County Certified Green Business and claim that all of their waste cooking oils go directly to making bio-diesel. They support small farms and sustainable agriculture and serve mostly natural and organic foods. The tables are tiny and jammed with all kinds of convenience items. 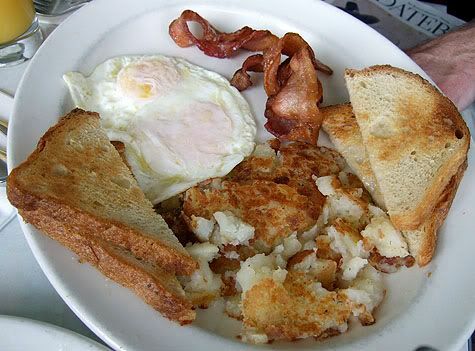 I had Nick’s Pick, which is 2 eggs (3 if you want for no extra charge) cooked to order, with choice of bacon, ham or sausage patty. I was craving the pig, and was thinking of a nice thick slab of succulent ham. What I got was a little bit dry and took quite a bit of effort to cut with my butter knife, but I am sure by its very leanness and lack of blubbery fat that it was a pig who had roamed around freely. It was very delicious with the various mustards served on each table. 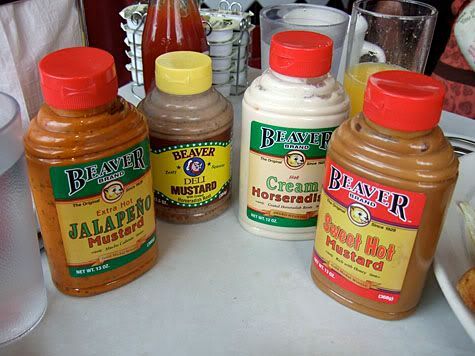 A fine assortment of Beaver brand mustards and a bottle of creamy horseradish. The only thing missing was Tabasco. 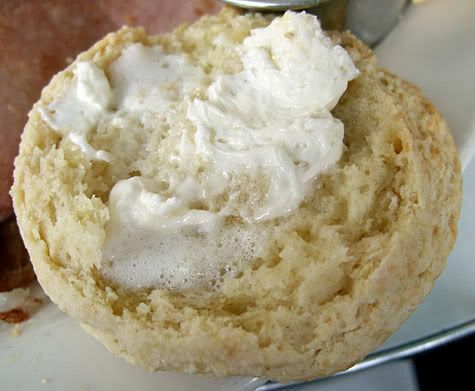 Here’s a closeup of my delicious biscuit. It’s crumbly and light and perfect smeared with butter and drizzled with honey. 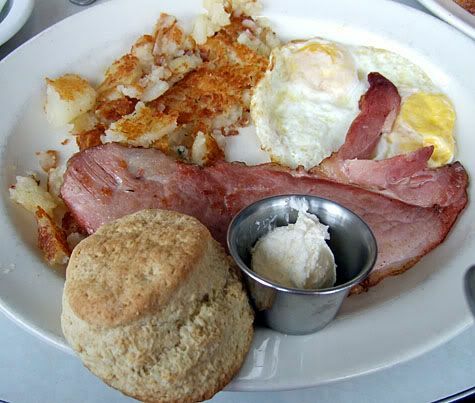 Mr. K also had Nick’s Pick with bacon and sourdough toast. The homefries they serve are of the griddled mashed potato variety, which I normally don’t like, but these were delectably crisped on both sides, and well seasoned so we gobbled them up. The bacon was free form, not laid flat to be cooked in a griddle, which made me think that they were fried. The fatty parts were light and crispy and the meat was chewy. 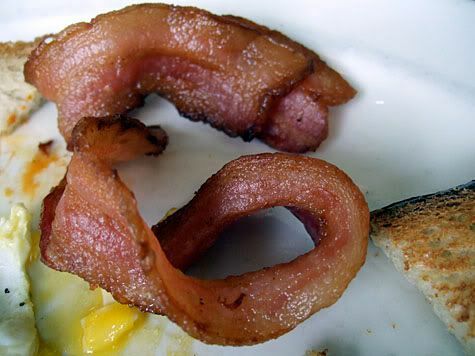 Mmmmm, fried bacon. I am happy that Bubba’s is still serving those biscuits, it’s a great treat to look forward to as a way to kick off a road trip up north. Happily, it doesn’t take that much effort to convince Mr. K to stop here. 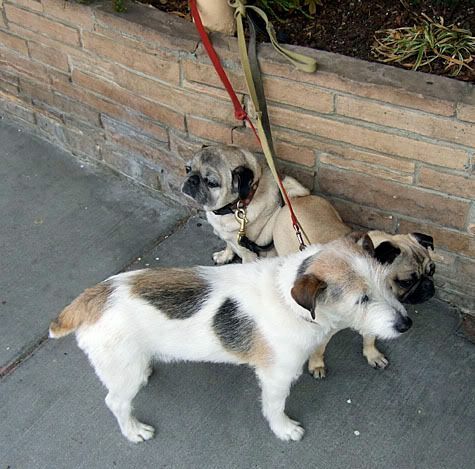 San Anselmo has that expensively casual feel that is the essence of Marin and there are tons of dogs parked along the street waiting for their servants to come pick them up. Rowena, breakfast is my favorite meal! Life in Italy always sounds so lovely but don’t mess with my ketchup on the fries…. You’re pictures are awesome. I just want to reach out and grab a piece of that ham. Those dogs were so cute! 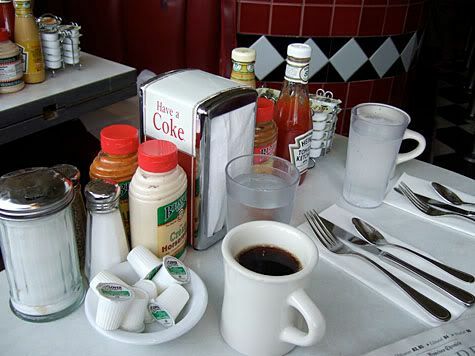 I liked the diner too, it had a real retro feel in your photos. WOW! this is a great place and thanks for the good recommendation. Now I’m looking for the honey balsamic dressing that was on the Titanic Salad. Can you help? can’t find their cookbook online.